She was very scared and had been in the dark for six weeks. Rescuers couldn't have anticipated that they'd find more than just rabbits in the basement of a breeder's home in New Jersey. Last week, Mike Stura, founder of Skylands Animal Sanctuary and Rescue, got a call from a friend about a hoarding situation in Hunterdon County that had gone from bad to worse. 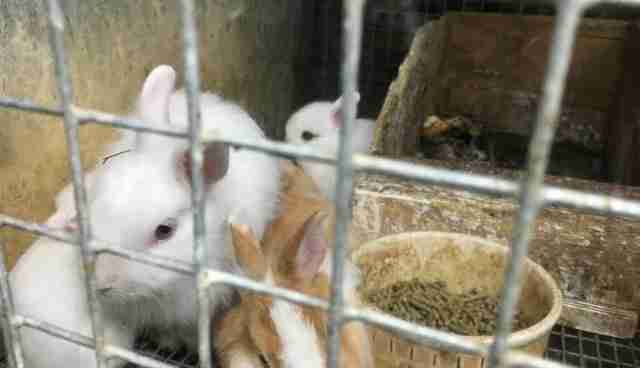 According to Stura, a potential buyer stopped by the residence with the intention of purchasing a rabbit. 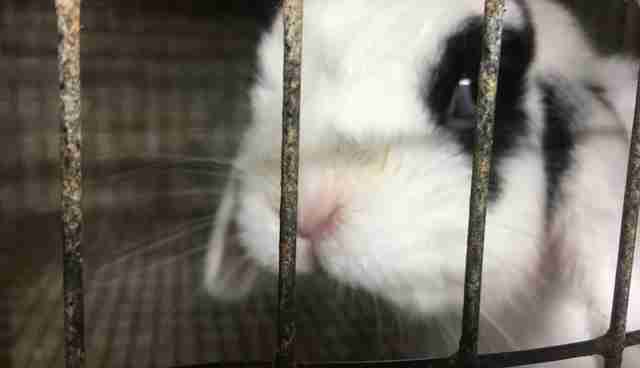 Once they were exposed to the conditions in which the rabbits were being kept, they got in touch with the New Jersey SPCA (NJSPCA) to intervene and rescue the animals. 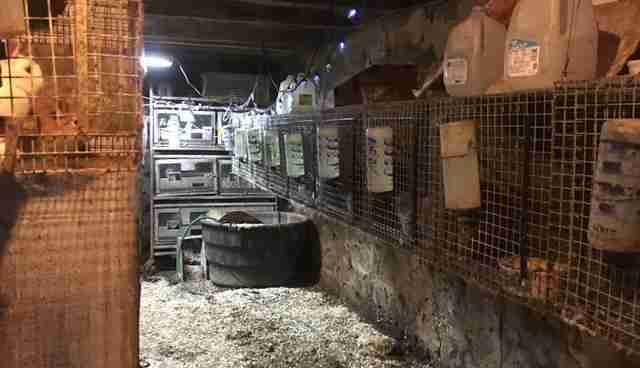 "They found rabbits in rows and rows on the walls of a shed," Stura said. "It was very hot and damp in there with no ventilation." Furthermore, the rabbits all lived in their own filth and were cooped up in rusted cages, filled with old food that was teeming with maggots. Stura said people actually didn't live on the property where the animals were found - the space was solely used for breeding and storing the animals. 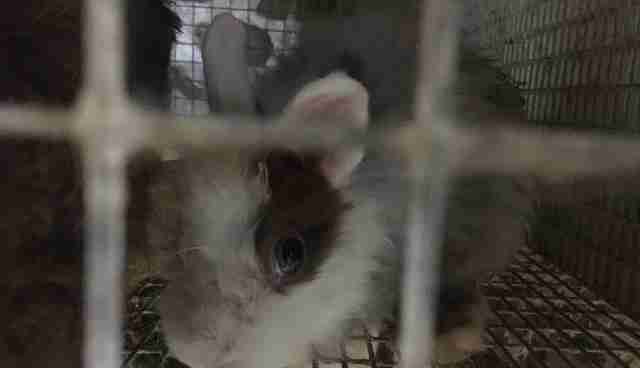 In addition to rabbits, guinea pigs were also found, the total animals nearing 300. The owner of them gave them up to the NJSPCA. 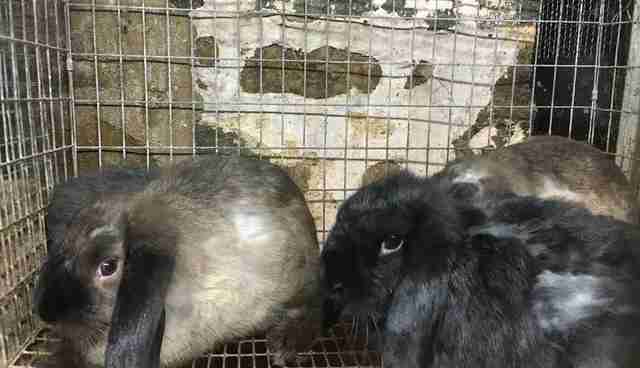 "They were in the process of getting those rabbits out from the shed," Stura said. "They went to the house attached to the property and found even more rabbits on the first floor. 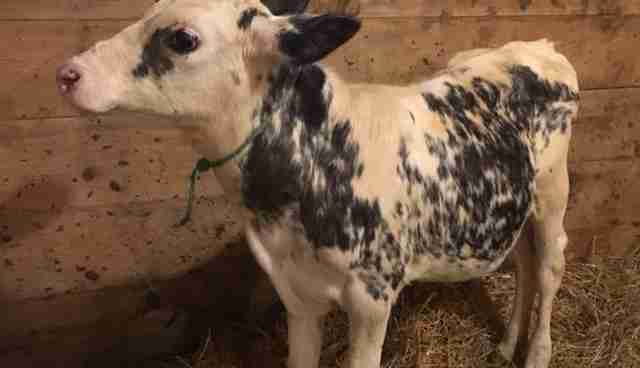 One of the SPCA agents went around the back of the house and saw a calf looking back up at him from the window of the basement." That's when Stura was called in to rescue the young female cow. "She was living in the basement with several inches of rabbit feces and urine on the ground," Stura said. Since the rabbit cages in the basement were elevated, the calf had no choice but to cower underneath them - drenched in the waste of the trapped rabbits above her. "She was yellow-stained," Stura said. "She was very scared. She had no human contact, really." 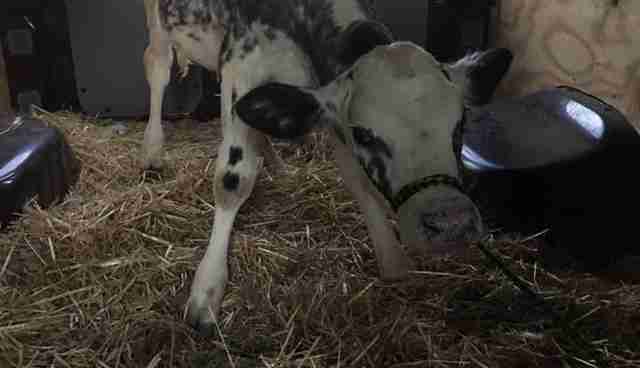 When Stura reached out to examine the 10-week-old calf at first, she bolted - repeatedly running away out of nervousness and fear. Ironically, the owner of the calf had other cows and horses all kept outdoors. Stura said when he asked the woman why she had a cow in a basement, she told him that she heard she could get a tax break if she owned three cows, instead of two. 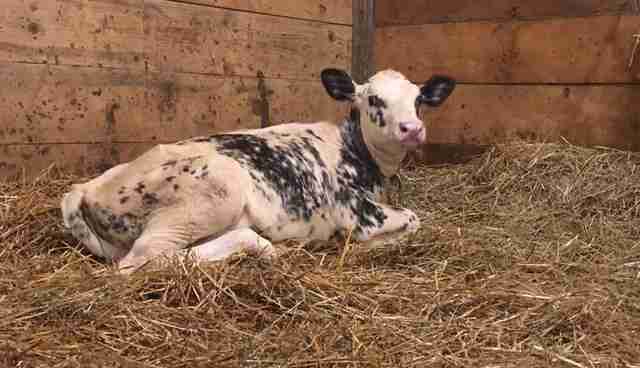 So, she went to an auction and purchased the calf. 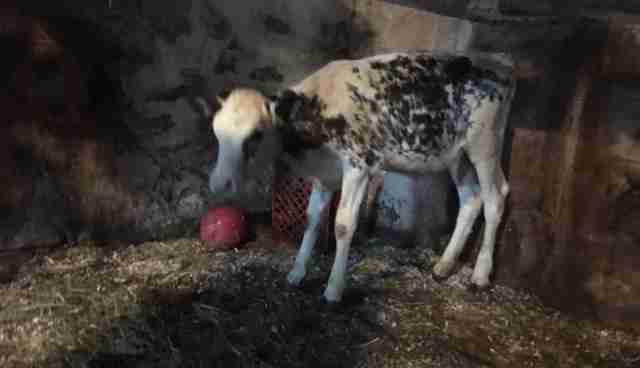 However, since the calf was still so young and small, she decided to kept the animal in the basement until she was large enough to mingle with the other cows outdoors. 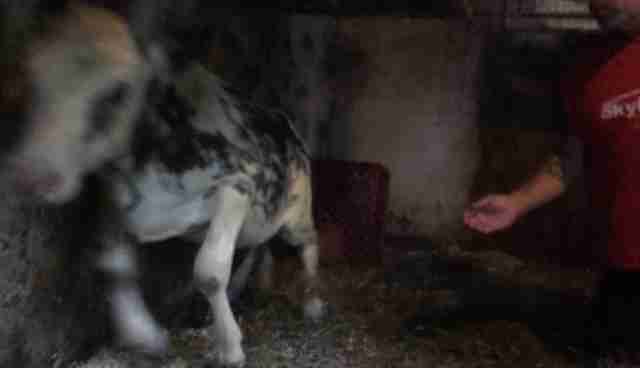 The calf had lived in the dark and filth for six weeks before the rescue. 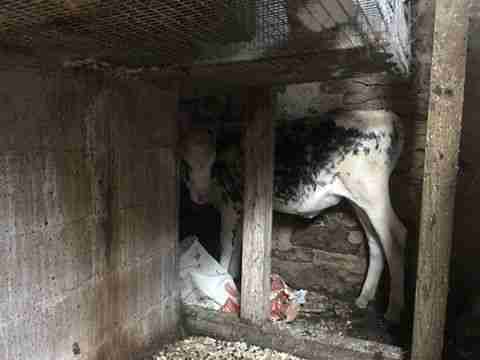 "It was startling to see a cow in a basement like that," Stura said. "You don't expect to see that, especially in those conditions." 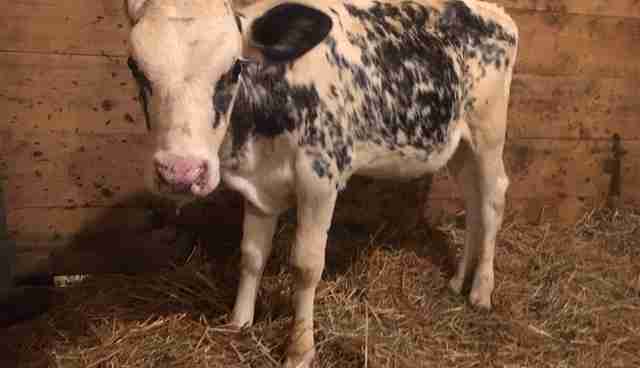 Stura expects that charges will be filed against owner of the cow and rabbits. Once the cow, whom Stura has named Violet, was rescued, she was bathed and treated for pneumonia. She currently has an enclosure filled with clean bedding for her to relax in until she gets the clear from her veterinarian that she's healthy enough to join the other cows out in the pastures of her new home at the sanctuary. "She is doing so much better already," Stura said. Want to help Skylands continue doing good work for animals in need? Consider making a donation here. If you live in or near New Jersey and are interested in giving a home to one of the animals seized from the house, learn more about how you can adopt here.